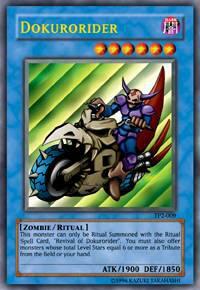 This monster can only be Ritual Summoned with the ritual Spell Card, «Revival of Dokurorider». You must also offer monsters whose total Level Stars equal 6 or more as a Tribute from the field or your hand. ja'ime cette carte xhépa pk?